I can happily say I have a fairy girl tribe. I mean, artist girl tribe. I mean, GIRL TRIBE. Strange and glamorous and lovely these tribe folks be. Shout out to Kelsie McNair (@withlavandlace), Angel Graves (@angelisimpressed), Miki Ross (@photoartstrade), Chelsea Diane (@chelseadiane), and Lilah Rose (@lilahroseparade). Musicians, photographers, artists, wanderers, designers, writers all. I feel honored to have met and to know all of them! (Follow them all on Instagram. Their feeds ROCK). Hanging with these ladies feels like being in the Spice Girls, but without the fear of being mobbed by ten year olds. We spent the last 48 hours together in Richmond high-fiving each other over excellent taste in tea lattes. Here's what we did: cooed at each other, drank too much coffee, had a major freak-out dance party to terrible-great pop songs, consumed cider and a painfully large amount of popcorn, bought sparkly vintage clip on earrings, photographed each other in the sunset, walked around the Virginia Museum of Fine Art until we couldn't take it any more (mind-blowing-art-overload), snuggled around a fire with blankets and junk food, and decided what desserts we would be (I'm a pistachio cookie with mango sorbet on top, whatever that means), among other things. So much girly time. I'll be burping up sparkles for days. In other news, I tried on my first wedding dress. A faded, lace, tea-length piece from the 1940's. Just trying it on has given me the courage to start that process. I've been doing Instagram posts of my dailycoffee and breakfast habits. Spoiler: there's a lot of black coffee nerdling and avocado munching. The following is a riff on my (almost-everyday) ritual of avocado toast. It's amped up with cheese and spices to make it lunch-worthy. 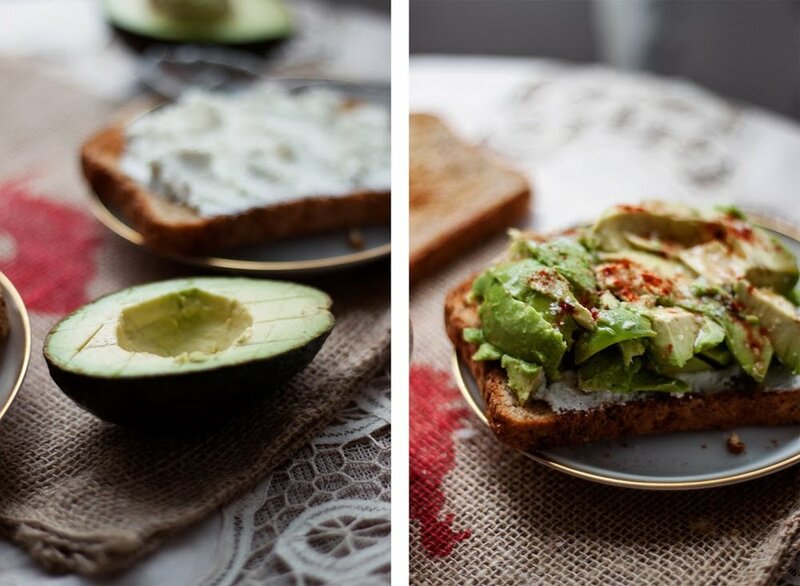 Chevre and avocado and maple and paprika and toast and ghee. Notes: ALL OF MY FAVORITE THINGS in sandwich form. This is a great mood-booster on a gray day. Creamy, fatty, brain-happy power to defeat wintertime blues! Spread ghee or coconut oil on both pieces of toast. 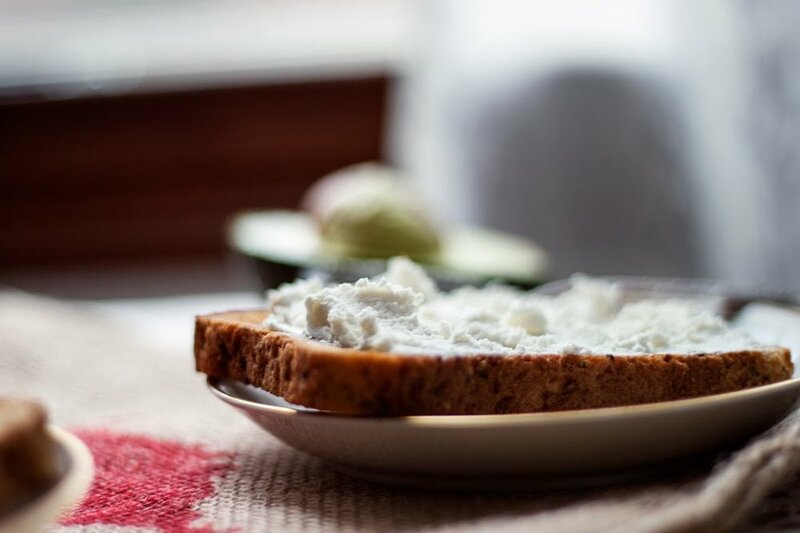 Spread chèvre over toast. Halve and scoop out avocado. Spread/place evenly over toast. Top with maple syrup, paprika, and sea salt. Place second slice of toast over top, and squish down lightly. Chomp it.